Staff Sergeant John Brdeja, Sergeant Maurice Cohen and Sergeant Joseph Johnson. Being wheeled toward the site is Beatrice Cohen, sister of crew member Maurice Cohen. Johnson) and Estelle Savage (aunt to Johnson). Last month, in Section 60, First Lieutenant Rob Jenkins was buried, along with five other members of a bomber crew. They were lost when their plane was shot down over North Africa in 1942. Rob Jenkins had joined the Army Air Corps after Pearl Harbor, and he was 20 years old on his final mission. Six decades later, his plane was found and the remains of the crew were carefully identified, returned home and buried with military honors. Rob's sister, Helen, said, "We were very proud that the government would care that much. After all, it was such a long time ago." This nation does not forget. For more than a half-century, Helen Jenkins Jackson had only an old photograph, a couple of tucked-away letters and precious memories of her younger brother. 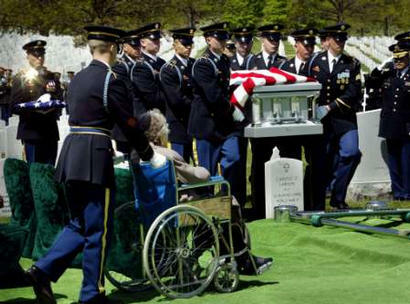 In April, U.S. Army officials gave her another piece for her collection -- an American flag and replicas of his lieutenant bars, wings and campaign ribbons encased in a triangular wooden box after a ceremony at Arlington National Cemetery near Washington, D.C. On Memorial Day, Presi-dent Bush immortalized Jackson's brother in his address to the nation. Sunday, Jackson will get something she never believed possible. The funeral for First Lieutenant Robert Boyce Jenkins will be held at Bethel Presbyterian Church in Clover, 61 years after his death in North Africa. His remains will then be buried in Bethel Cemetery next to his parents, George Pressley Jenkins Sr. and Martha Riddle Jenkins Forbis. Government scientists were able to identify Jenkins' remains through DNA testing -- his right humerus and pelvis, a portion of his left elbow and jaw bone and two vertebrae. The bones will be covered in the casket with a blanket and a new Army uniform. "We never dreamed there would be any remains found," said Jackson, 86, Rob Jenkins' oldest sister and only surviving sibling. "This has been a very spiritual experience." On December 15, 1942, the day after he was promoted to the rank of first lieutenant, Rob Jenkins was killed along with five other crew members when their Martin B-26 Marauder bomber was shot down near Bizerte, Tunisia, in North Africa. The 21-year-old bombardier-navigator died doing something he was passionate about. "Rob was chosen to do this," his sister said. 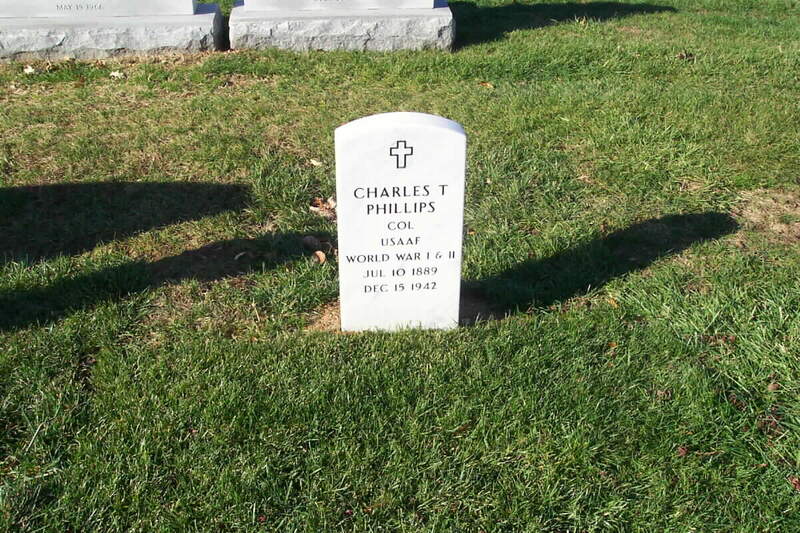 Rob Jenkins worked for a downtown Charlotte cotton broker and served in the Civil Air Patrol at Morris Field, where Charlotte-Douglas International Airport now stands, before joining the Army Air Corps, Jackson said. His parents had to sign for him because he was only 20. "After Pearl Harbor, he signed up," Jackson said. He trained under General James H. Doolittle and got his wings July 4. Rob Jenkins was borrowed from his regular crew for what turned out to be his last mission. His B-26 Marauder -- or "Widow Maker," as he called it in a letter to his sister -- was hit by enemy anti-aircraft fire and went down in what was believed to be the Bay of Bizerte in the Mediterranean Sea. Searches there yielded nothing. Discovery of Jenkins' plane and crew would have to wait nearly 60 years. Married and living in Pittsfield, Massachusetts, at the time, Jackson was at her parents' house for Christmas when a telegram arrived with word her brother was missing in action. Jackson, then 25, answered the door. Her mother had been preparing to host a Presbyterian women's circle when the news arrived. She still had the women over, Jackson said, but didn't tell them of the news until the meeting was over. Rob Jenkins' mother and his girlfriend didn't want to accept he wouldn't return. "She and mother were always hoping against hope that Rob would be found," Jackson said. "But, of course, at the end of a year they're listed as dead." "Killed in action," her husband, Fred, added. "I accepted his death," she said. "I just knew in my heart he was gone. I had peace." Rob Jenkins was born in Laurens after the family moved from Rock Hill, where Jackson was born on Reid Street. He skipped the second grade and later served as the senior class president at Central High School in Charlotte, Jackson said. He was the third of four children -- two boys and two girls and was in Jackson's wedding in 1940. Soon after word arrived he was missing, his brother George Pressley Jenkins Jr. left to serve in the South Pacific as a Marine Corps captain. "The best way I can describe him is that he was loved by both sides of the family," Jackson said of her brother Rob. "That's about as good as you can get." She named a son Robert Jenkins Jackson after him. Robert Jackson's 18-year-old daughter, Lee, will play the cello at Sunday's service. All of Helen Jackson's sons, including Larry Jackson of Columbia, Md., and Raymond Jackson of San Diego, went on to become officers in the U.S. Navy. Her only daughter, Mary Jackson Medlin, lives around the corner on Congress Street in downtown York. Larry Jackson was on hand in April with his family for the Arlington ceremony, where the unidentified remains of Rob Jenkins and other crew members were buried in a common grave bearing their six names. The sunny, cool day is one Jackson will never forget. Washington had tulips, and ornamental cherry trees were in blossom. She sat next to the daughter of the mission's pilot, who was promoted to captain the day after his death. Getting to that moment, though, took years. Because she and her husband had moved to York from Massachusetts, Army officials had a difficult time finding her, Jackson said. Then, one day more than two years ago, the telephone rang and Jackson answered. On the other end of the line was someone with the U.S. Department of Defense asking for Helen Jackson and her brother George. George was dead, she told them. What they told her next came as a complete surprise: The remains of her other brother had been found during the dredging of Lake Tunis, Tunisia, in November 2000. If they had found her sooner, she would have been invited to North Africa when military officials recovered the crew. The remains were taken from Tunisia to a laboratory in Hawaii, where scientists conducted DNA tests to determine which remains belonged to which crew member. The mother of one of the scientists working on the case lives in York, Jackson said. "We always hoped he'd call to tell her something," Jackson said. "I guess that's a little far-fetched, but we were so anxious." She called the researchers a couple of times, at least, over the two-plus years it took to identify what remains they could. She was always told they'd be in touch when they knew something. "It takes a long time to identify remains," Jackson said. Finally, officials called to say they were finished and invited the Jacksons to review the findings. Included in the detailed journal were letters from Jackson's mother, one requesting Rob Jenkins' trunk and belongings. "We just could not get over the fact that they'd saved those letters," Jackson said. "It's been long, but it's really a wonderful experience. It's wonderful ... just wonderful." Her brother will be buried a few miles from her East Liberty Street home that once belonged to Louis Mason Grist, their great-grandfather who once ran The Yorkville Enquirer. Rob Jenkins will be laid to rest in the Bethel community where his mother grew up and in the cemetery that contains the remains of five generations of his family. "I just feel that's exactly where they'd like him," Jackson said of her parents. "I'm sure my mother would be pleased." Besides having her brother close to home, Jackson also will have the few mementos she's collected since his B-26 was found. There's the hand-carved necklace of ivory beads found among his belongings that she wore to the Arlington ceremony. She'll wear them again Sunday. There also will be a Gold Star pin attached to her shirt. Normally reserved for the mothers of fallen soldiers, it was given to Jackson in Arlington because she's the only survivor. Shuffling through a stack of papers, Jackson located another memento -- a transcript of President Bush's Memorial Day speech she and her husband found online. 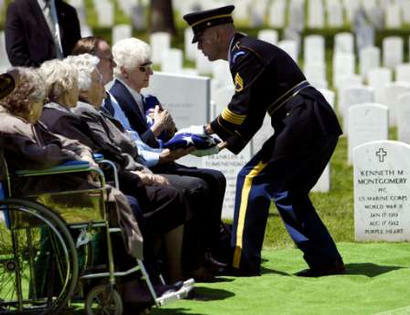 Jackson read the president's words delivered May 26 in Arlington: "Last month, in Section 60, First Lieutenant Rob Jenkins was buried, along with five other members of a bomber crew," she said, reciting the speech. "They were lost when their plane was shot down over North Africa in 1942. 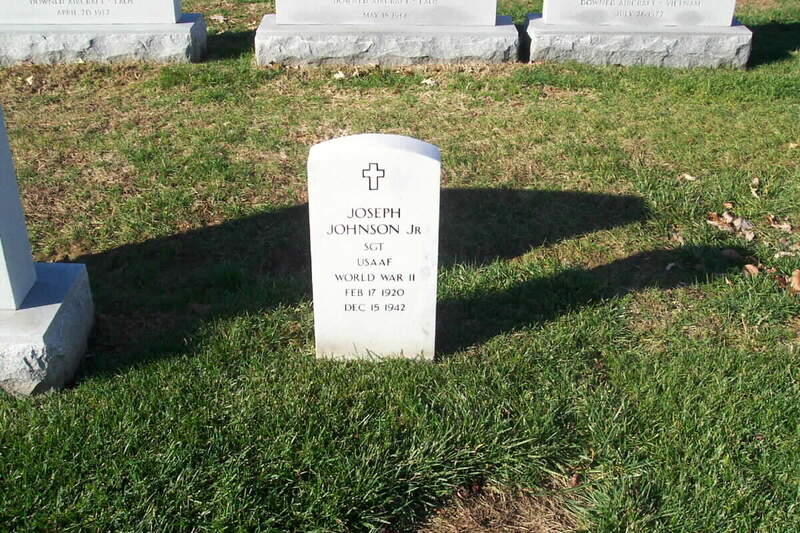 Rob Jenkins had joined the Army Air Corps after Pearl Harbor, and he was 20 years old on his final mission." -- "But I'm pretty sure he was 21," Jackson interjected before continuing. "Six decades later, his plane was found and the remains of the crew were carefully identified, returned home and buried with military honors. Rob's sister, Helen, said, 'We were very proud that the government would care that much. After all, it was such a long time ago,'" the president said. "This nation does not forget." And neither has Jackson -- not her brother, his life or his sacrifice. Sixty years after his B-26 bomber went down over North Africa, Rob Jenkins is finally coming home. And a family will have a chance at healing. Jenkins' big sister, Helen Jackson, lives in York, South Carolina, and is 86. His brother, George Jenkins, died years ago without ever knowing what really happened to the baby of the family. Until November 2000, the family understood that Jenkins' B-26 Martin Marauder was shot down by German antiaircraft fire over Tunisia a year after America was drawn into World War II. He was 20 and the plane's navigator-bombardier. They were told the plane ended up in the Mediterranean. But in 2000, workers dredging Lake Tunis found the plane and remains of five crew members inside. Army scientists in Hawaii identified some of those remains as Jenkins', using his sister's DNA. Sunday, two Army officials met with Jackson and husband Fred in York to make final arrangements for shipping the remains to York for burial. A graveside service with full military honors will be June 8 at 3 p.m. at Bethel Presbyterian Church near Clover, S.C., where Jackson's and Jenkins' parents married and are buried. Five generations of their family are buried there. Later this month, the Jacksons plan to attend a ceremony at Arlington National Cemetery near Washington with families of Jenkins' four crewmates for a mass burial of remains that could not be identified. All this -- and the painstaking efforts by the U.S. government to identify remains -- has moved Jackson to tears. "I am amazed that our government went to such great pains to do this," Jackson said. "It is incredible what they went through to find the plane and identify the remains. It was just so thorough. We were all devastated by Rob's death, but very proud that the government would care that much. "After all, it was such a long time ago." Jenkins grew up in Charlotte, graduated from the old Central High School and joined the Army Air Corps weeks after the attack on Pearl Harbor. He was on his fifth mission on December 16, 1942 -- a newly promoted First Lieutenant and on loan from his crew -- when the plane was hit and disappeared. His parents as well as his brother died not knowing what happened. Jackson is the surviving child of four that her parents raised in Charlotte. Since she and her family had moved around over the years, it took the Army months to find her. Her first call came in summer 2001. Now remains of her brother are coming home. "All this is really something, totally mind-boggling," she said. "I am just so caught up in it. I am just so moved by it."